Team League and Selfie Tournament Standings! Here are the current Team League standings! First Place is Pindemonium Zwei with three wins and 21 total points. Second place are the Region Rats with 2 wins and 16 points, and trailing just behind them is RIP Tommy B also with 2 wins, but only 15 team points. Currently in fourth are the reigning champions Super Jackpots with 1 win and 13 points, closely followed by The Doom Room who hold a head to head victory over the Super Jackpots but only have 11 points to currently go with their 1 win. Coming up in the rear are the Pull & Pray team currently with no wins and 5 points on the season. We have two games left for each team. Due to Valentines Day next Thursday we are going to cancel team league and instead hold a doubleheader night the following week on February 21st so please make sure that all teams can show up that night and we will wrap up the regular season. Finals night will take place on February 28th where the top 2 teams will face off to win the Team League Cup! The next two teams battle for 3rd, and the bottom two teams fight to not claim the shame of the season. Also as a reminder, the selfie games for this month are The Shadow and Monster Bash, you have all month long to get scores entered on those games. 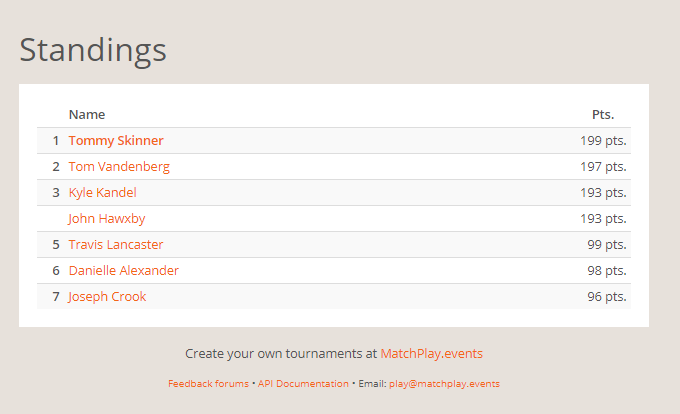 Here are the current standings for that tournament. Lastly, there is a big tournament at Tappers in Indianapolis this Sunday. The Indiana Matchplay State Championship title belt is being defended by current Champion Scott Elliott. Everyone is obviously encouraged to come and take a shot at winning the title! Tournament starts at 5PM, be there or be square!